Some days I wish these lazy, hazy days of summer weren’t so crazy. Too many paths go unwalked, too many stars aren’t stared at and too many birds aren’t looked for. The season moves, and I’ve already missed so much of it. Even though summer isn’t my favorite of the seasons, some things can only be enjoyed and seen in summer, and so much of it is already gone. The local soft ice cream stand closes on Labor Day, and I’ve only partaken once. I managed to get my swimsuit out of winter storage but never got to go swimming. I have yet to have a cookout or make s’mores. The seat cushions on my outside chairs need replacing, and the stores have already put them away until next summer. ...the goldenrod turns golden. Last evening was the first I found some that had turned color. I’ve been keeping an eye on it, waiting for the green seeds to turn golden. 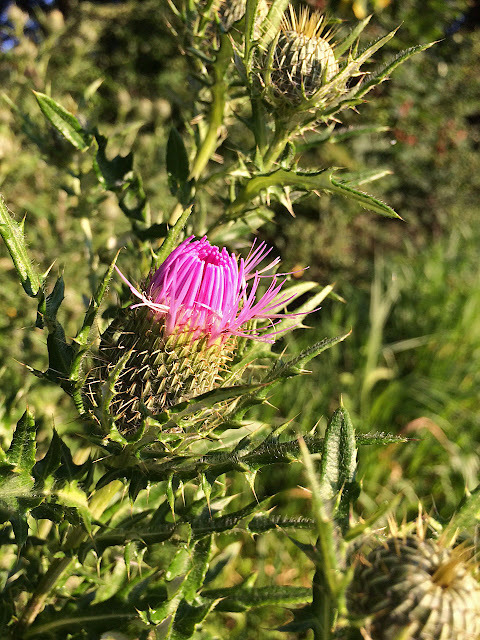 The arrival of the goldenrod and also of the purple-flowered thistles are a sure sign that late summer is here. The change that has the most impact on me, and possibly on my readers, too, is the every-shortening hours of daylight. It’s dark when I walk the dogs in the morning, and I now have to rush to clean up after the evening meal if I want to walk around the mountain before it gets dark again. And this is only the beginning of those shorter hours of daylight. I suppose that’s a small price to pay for the next season’s cooler temperatures. Still, on some ideal earth with a different tilt, I’d order up cooler temperatures AND longer hours of daylight. 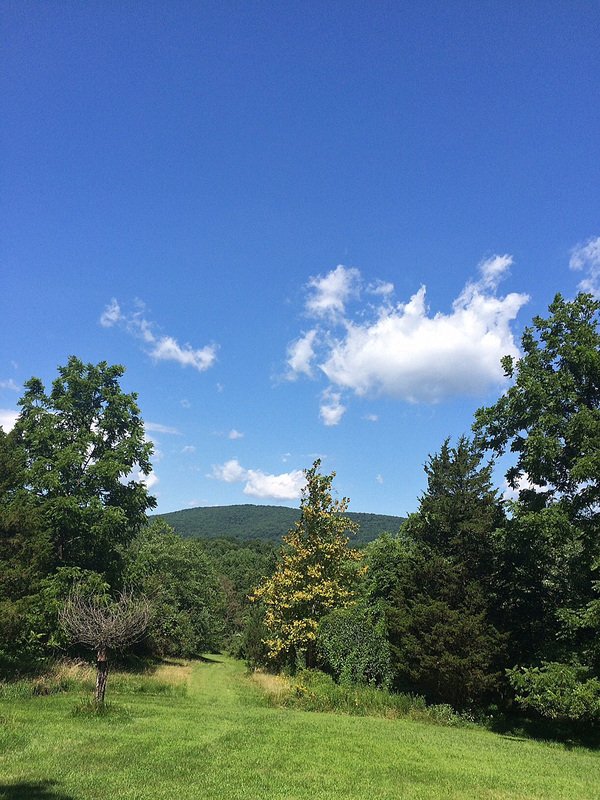 Summer has reached the later part of its season here on Roundtop. The woodland birds have fledged and are out on their own—often with clownish feather-do’s in some weird combination of baby feathers and adult plumage. Saturday night saw a decent early-season migration. On Sunday morning I saw a flock of robins, about half of them this year’s young birds. I also found a few warblers, which is never more than I see here. Roundtop isn’t a warbler hotspot, by any means. 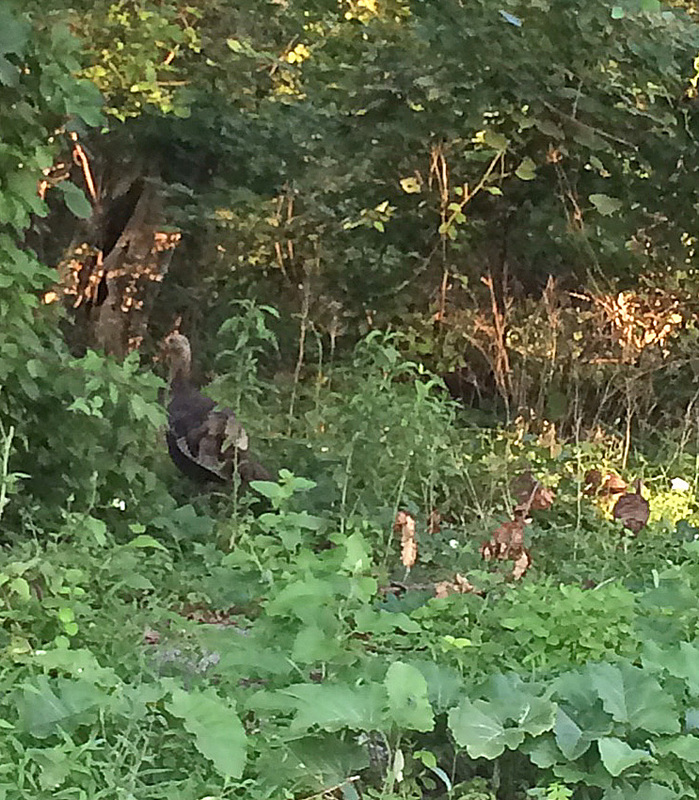 On Friday evening I found, again, the family of wild turkey I occasionally see. They were stalking the edge of a cornfield, the young poults already grown since the last time I saw them, which wasn’t very long ago. There were more of them than I could fit in the frame--another hen and several more poults. 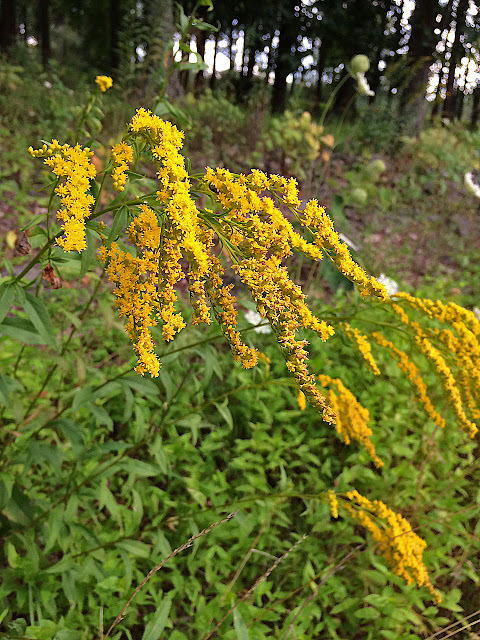 can see a change in the undergrowth of the forest—there’s less of it. The first of spring annual plants often die back after they flower. For me, this amounts to being able to see deeper into the forest again, instead of finding a thick curtain of greenery obscuring anything more than 10 feet away. This summer is shaping up to be less hot than average—it’s still too warm for me. I’m ready for fall with the first day of 90 degree day. This year, that came later than it often does and didn’t last as long as usual, too. At least this summer wasn’t a constant stream of hazy, hot and humid days, but instead was a constant stream of warmer than average days, with no seesawing back and forth between hot and cooler. It was just constantly in the mid to upper 80s, and the night time temperature didn’t drop as it often does. As a result the overall effect was a summer about 2.5 degrees hotter than the average of the previous years. Right now it looks like the 10th hottest August of recorded temperatures in this area. As I said earlier, I am ready for fall, but I know I’m going to have to wait a while longer. 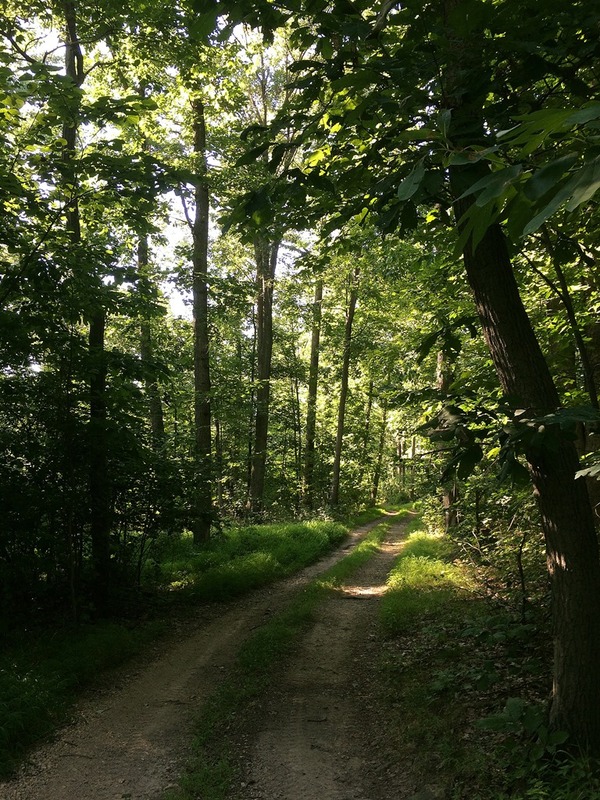 It’s been a hot week on Roundtop Mtn., and I’ve had a busy week with a variety of evening activities, so my times of being out and about in the forest were more limited than usual for me. As a result, my observations have been more subdued or unsuccessful than usual. I’ve been looking for nighthawks in the evenings—no luck so far. I’ve been looking for swallows that are not the ubiquitous barn swallows—ditto, no luck. Anything that moves is hiding, it seems to me. Or perhaps, the forest creatures have simply found that ultimate cool spot and aren’t about to leave it and let something else take it away from them. About the only thing I have noticed are things that do not move. 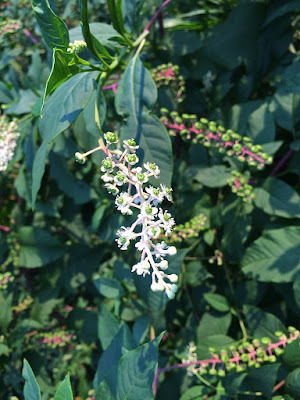 Today the thing that is not moving is the pokeweed. 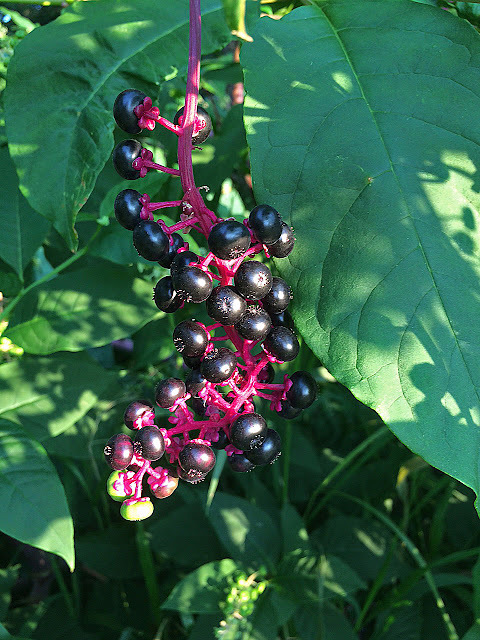 I found a huge bush of it, and what I found most interesting that the same bush contained pokeweed berries in a variety of stages—flowering, fully budded but green and fully ripe. In case you didn’t know, I’m going to remind you that pokeweed is toxic and poisonous to humans. Birds love it and are unaffected, as are some smaller animals. I’m told the plant becomes more toxic the more mature it becomes, and death can occur by eating only a few raw berries. Animals often avoid the berries because they are bitter, but farm animals have been poisoned by leaves that end up in their fodder. Humans can eat the leaves, provided they are boiled several times, with the water discarded after each boiling. Thanks, but I think I’ll pass on this one. Anyway, I just enjoy looking at the berries and the birds that come to the bushes for them. The midsummer forest has its own special look—the bright greens of spring have faded but the dry and brownish shades have yet to appear. At the moment, the woods are a deep shade of emerald, made brighter by the golden rays of late afternoon. A few of the annual plants are gone, and the forest floor is a bit more open than it was in May and early June. When the temperature is comfortable, as it has been this week, the time is a lovely one to walk in the woods. Each season and mini-season has charms, of course. Midsummer is not always my favorite, though much of that is because of heat and humidity. When those are not oppressive, the season is delightful and a fun time to explore in the forest. Last evening was one of those times, and my wandering was accompanied by the sound of wood thrush, still singing, deeper in the forest. The mosses are already sprouting seed pods, tiny little groups of stalks like miniature fields of wheat, all within a span the size of an open hand. Back at the cabin I found a lovely and large moth, likely a sphinx moth, that refused to light and let me look at it closely. It fluttered deeper into the woods and finally away from me, forever to remain a mystery, like so much of the forest, especially on a midsummer eve’s ramble. ...It’s time for the Perseid meteor shower! I got up at 4 a.m. this morning and went up to the Roundtop’s north parking lot to watch the Perseids. Wow! What a show! For once it was clear and no moon was up to brighten the sky. Orion, that familiar winter warrior, was just above the eastern horizon. The milky way stretched the length of the sky. I saw lots of meteors—one almost large enough to call a fireball, several really good “ordinary” meteors and lots of little ones. In the 45 minutes or so I was there before dawn intervened and ruined the viewing I probably saw 35-40 meteors. If I’d brought something to lay on I could have seen more of the sky at one time and likely found even more. It was the Perseid show I’d seen in years. ...I have to wear my headlamp in the mornings when I walk the dogs again. The days are growing shorter. ...The thistles are blooming and the American goldfinch are enjoying the riches. Pokeweed berries look fully formed but are still green—it’s not that late in the season just yet. Rescuing turtles from the middle of a road is a regular occurrence for me. 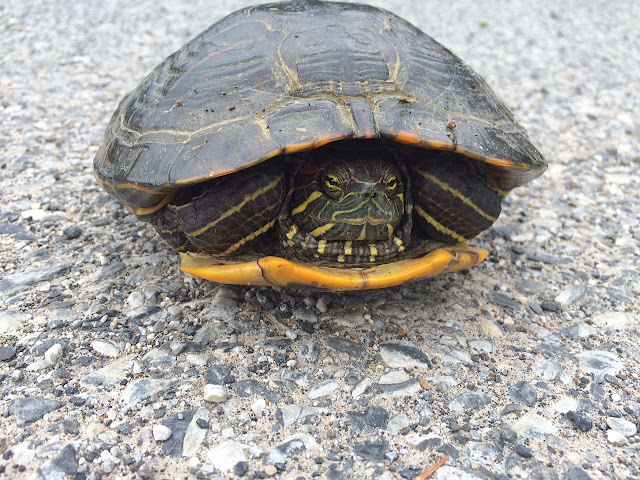 Box turtles are the most frequent species in need of being removed from a road. 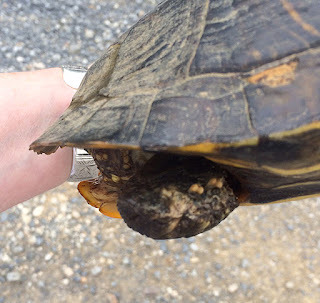 Occasionally I also find a snapping turtle, which I can usually urge off the road by getting it to snap at something like a stick and leading it, snapping all the way, to the edge of the road. My Sunday morning rescue was large and old. It was likely a female, as they are about an inch larger than the males. This one was easily 8 inches long, putting it near the upper end of both species’ size. Its turtle growth rings on its carapace were worn to the point where I couldn’t count them to guess how old it might have been. 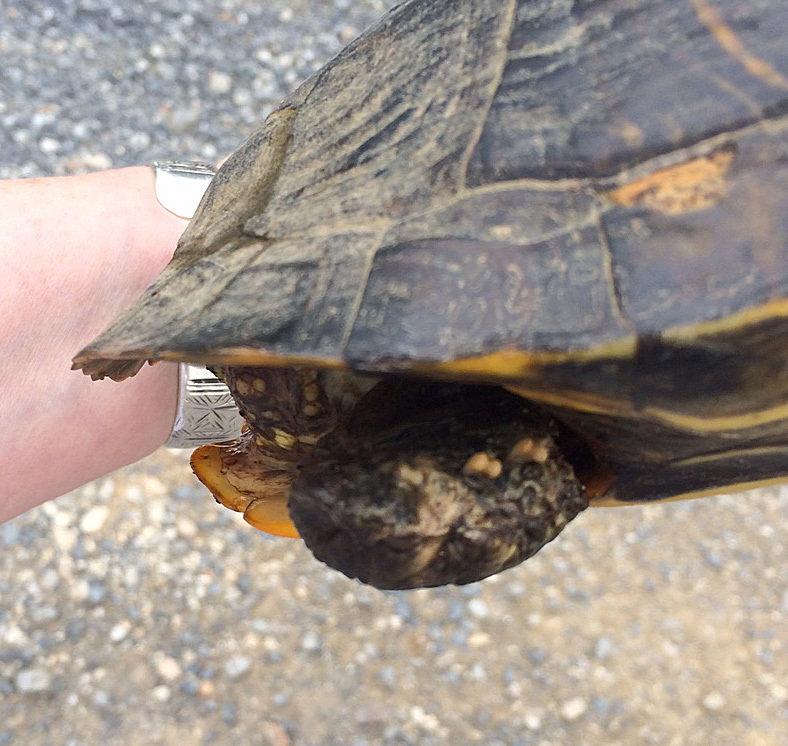 This turtle seemed in fine health, despite an old injury that resulted in the loss of at least one of its rear toes. 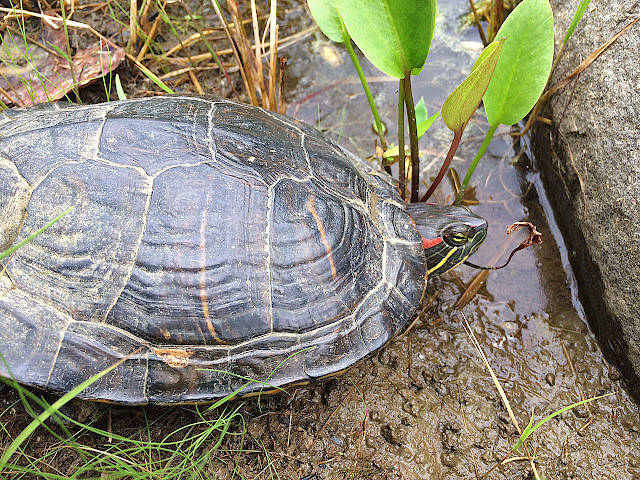 Said turtle hid from me most of the time and only deigned to show off her pretty red “ear” stripe after I’d released her for a few moments. I hope this one has many more years ahead of it—whatever her exact species. My adventure camp will be over after tomorrow. Where is the summer going? To me it feels as though I should only be on week 2 or 3, not week 8 of camp. Already the first of the poison ivy leaves are turning red, and now the famers are baling hay, too. Before I know it, pumpkins will be for sale at the local farm markets. Today, I am glad simply that the humidity of midsummer is gone and is not returning on even the longest of the long range forecasts I can find. To me, this means even if that dreaded weather does return, it can’t settle in and stay for months because the season is too far along for that to happen. Hazy, hot and humid weather starting in early June is dreadful because I know it may stay that way until the end of August and that’s just too horrible a thing to even bear to contemplate. These less humid days and cooler nights with more of the same ahead are far more to my liking. The only downside—and it’s a small one—is that it is now time to wear my headlamp again during my morning walks with my now 10-year-old Baby Dog. By the time I start a walk with the puppies, the headlamp can be put away for the day. Could it be? Is it possible that the worst of summer is already over? It’s too soon to say so definitively, but the signs are trending positively. 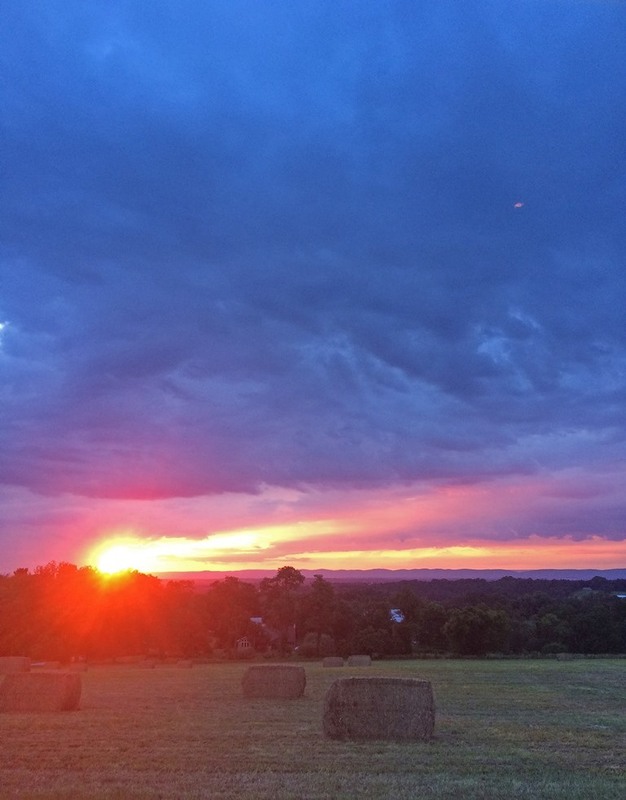 Yesterday was the usual hazy, hot and humid summer day that topped out at 90 degrees. 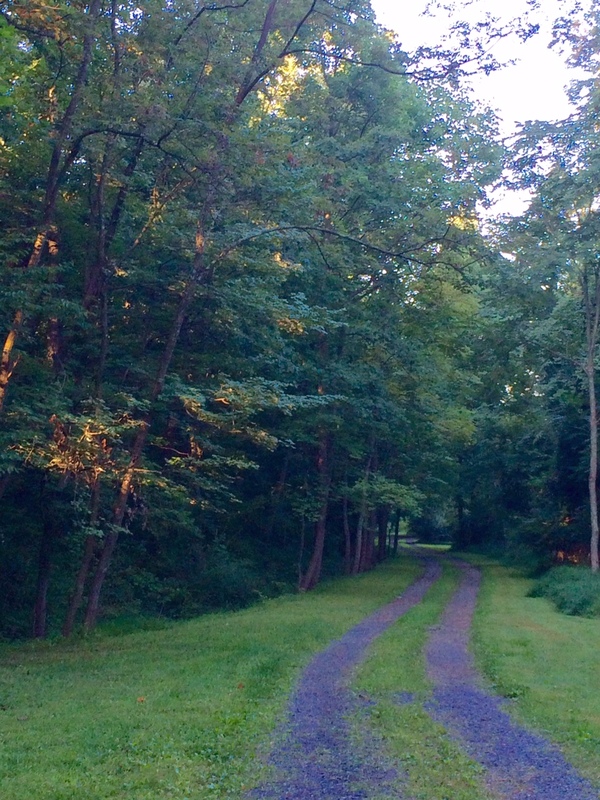 At dusk, I walked the dogs, though not very far. Returning to the cabin, I stood and watched a small bat cavort through the trees, gobbling mosquitos overhead in the one opening in the forest canopy created by my cabin. It was a small bat, though all bats look small when they are at treetop level. And even the so-called big bats are less than 5” in length and only about a foot from one outstretched wing to the next. That said, my guess as to the species of this bat is the Little Brown Bat, Pennsylvania’s most common bat. They are just over 3” in length and about 8-10 inches with wings spread. I like watching bats—anything that feeds on mosquitos so voraciously is okay with me. And despite the fears of many, I think they are cute little things. A fierce thunderstorm swooped through in the middle of the night, wakening everyone and keeping everyone awake for a solid hour with brilliant bursts of lightning and sharp cracks of thunder. Today, the humidity is gone, though it is still hot enough for me, if much more comfortable than yesterday. Even better, the forecast for the next 10 days shows no more 90 degree temperatures, with more than a few days struggling to reach 80. Northwest winds tomorrow and Thursday will even bring a small slug of raptor migrants down from the far north. Fall is beginning to approach, and summer is starting to feel as though it has reached its peak and is now beginning a slow slide to cooler temperatures. That’s never too soon for me. 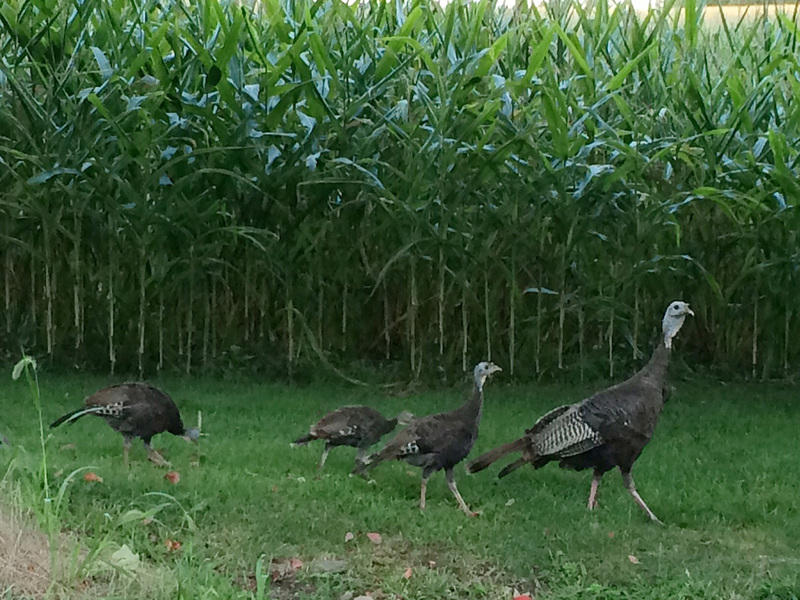 It's not a great photo, but when a family of wild turkey is crossing the road in front of me, I have to take what I can get. I never did get a full count of the poults, though there were at least 5-6. A second adult turkey was also helping to shepherd this crowd across the road, though she (I assume it was an auntie) was too shy for the photo.